Last year around this time I started working on a new layout in 1/43. If there is interest I will post more pictures and progress updates on this forum. There has always been a slowly smouldering interest here at Freerails, in the WWI 'War Department Light Railways'. As a 2-footer in 1:35 scale, the car builds of the W.D.L.R.s have always interested me. ... is a trail-blazing modeler, to encourage others to take a greater interest in the subject. ... would really like to see what you are up to & get updates on your project ! 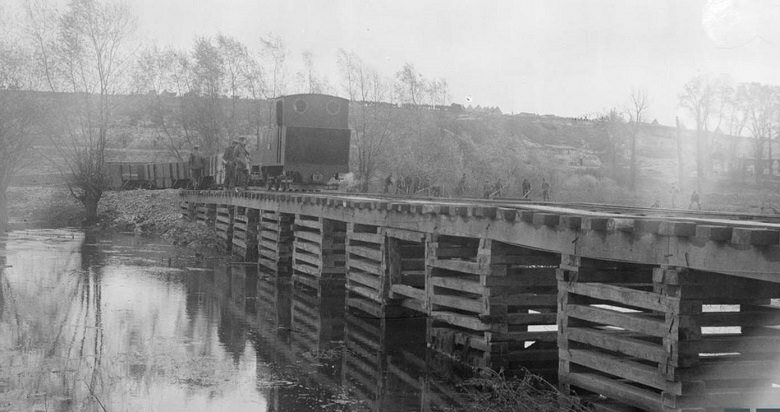 Pre Bailey Bridge, by the looks of it. I'll be tuning in, for one !! Tell us & show us M O R E ! That modelling looks really good. (British, Canadian, Australian or New Zealand) somewhere in France. 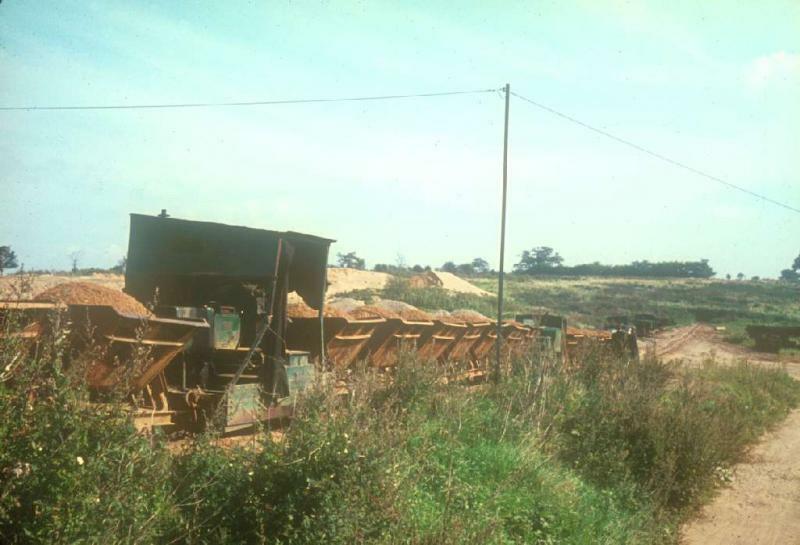 but maybe just out of a transshipment yard behind the lines. since I got WJK Davies's book as a school history prize in the late 1960s. 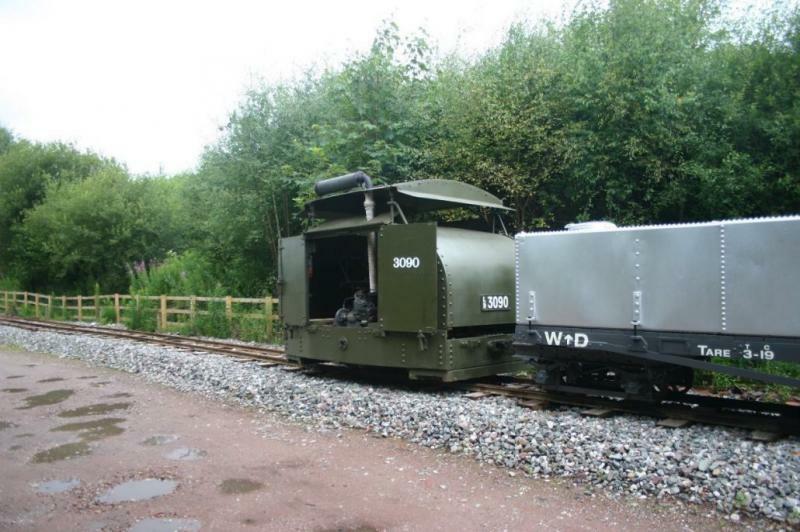 The Motor Rail 40hp "tin turtle" is very well done. You may know one was recently restored (see attached). 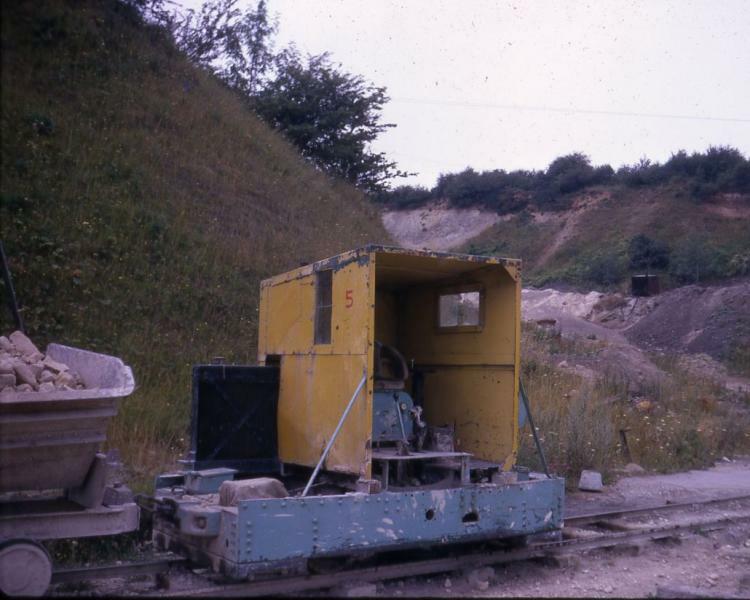 and was stored at workshops about a mile from my house. Of course it was gone/preserved before I moved here. I am looking forward to see how the model progresses. This is the "tin turtle" without the tin hauling chalk. I look forward to any modeling of them. And what a mechanic can do to Motor Rail's finest. Surprisingly it is being restored and might be working this year!!! 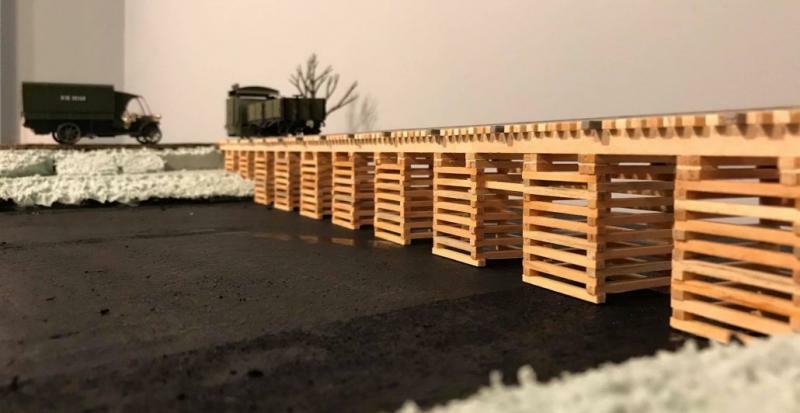 Yes, please post more photos of your 1:43 layout. 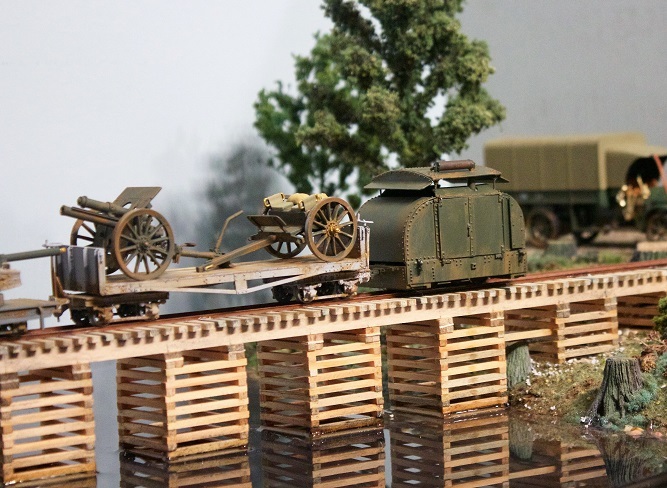 Great to see someone building troop railways, maybe you will "infect" more to follow. I will continue to post information as there appears to be a demand. I have done lots of research and when ever possible I am trying to build scenes of photographs I have found. Most pictures we see of the war are nasty muddy types in no mans land. Those pictures are pre 1918 for the most part. In 1918 the war was generally being fought on new land that was not as muddy. Here is a link to some actual video taken as a cab ride on one of the lines. Here is a picture of the bridge scene I am modeling on one 4' Module. 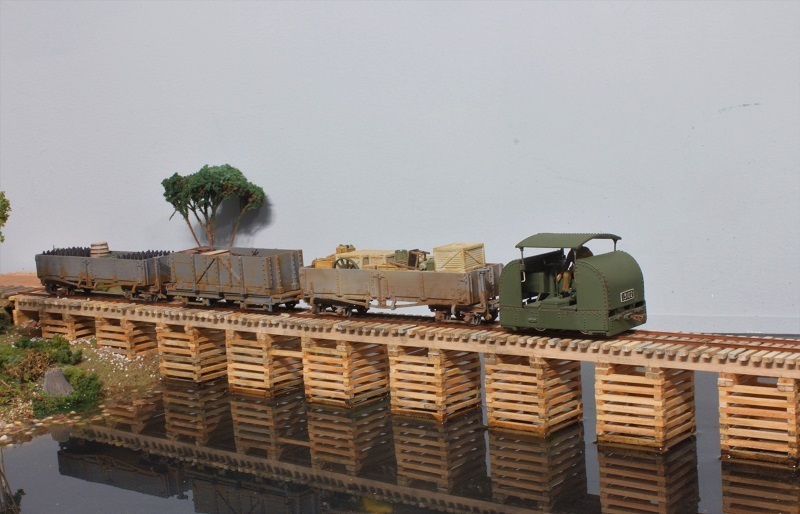 Here is a picture of the bridge before the scenery was added. And a picture of the completed bridge from the other direction.